We are so proud of our Eromit puppies! – earned new agility title Master Steeplechase Dog of Canada at 12 years of age! – earned her Working Certificate! 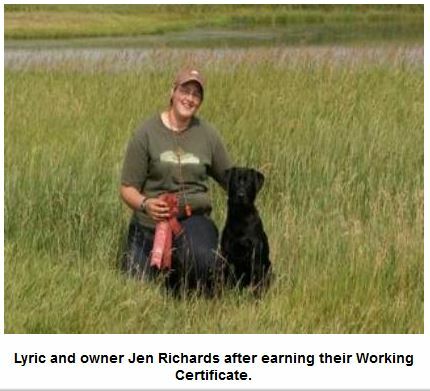 – earned her Working Certificate and 2 legs towards her Junior Hunter Title! – earned her Working Certificate and Junior Hunter Title! -earned 2 Starter Gambler’s legs and 2 Starter Snooker legs towards his SGDC title! -earned her 2nd Advanced Gamblers leg towards her AGDC and 2 legs towards her MSDSC title! -earned his first leg towards his Junior Hunter Title at only 7 months old! -earned her first leg towards her Junior Hunter Title at 7.5 months old! – earned his Junior Hunter Title going 3 for 3 at the Saskatoon Retriever Club Hunt Test! -earned 2 Starter Jumpers legs and 1 Starter Gambler legs towards her SGDC title! -earned 1 Starter Gamblers leg towards her SGDC title! – earned 1 Starter Jumpers and 1 Starter Gamblers leg towards his SGDC title!